Additional basic shapes can be used to mock-up a level. Unity already has some basic shapes (Cube, Sphere, Capsule, Cylinder and Plane), than can be used for creating a test-level without needing to open another tool. But why stop here? What about other often used shapes such as staircases, pyramids or cones. Creating level design procedurally. Unity 3 already includes a tree editor, but you can easily create scripts that creates cities, characters and other game props procedurally. The last reason for creating meshes procedurally is that it is fun. And by creating scripts that generates meshes, you’ll learn a lot about how Unity handles meshes internally. A polygon mesh in Unity is created of triangles. The most simple 3D shape is a Tetrahedron – a simple 4 sided shape. The vertices are Vector3 positions and the triangle faces indices are integers (The illustration above uses one based index, but Unity uses zero based indices). The Tetradron is created by 4 triangles. The first triangle has the vertex indices 1-2-4 (the vertices P1, P2, P4). The triangle must be defined using clockwise polygon winding order – this is used for backface culling (usually only the frontside of every triangle is draw). By using shared vertices, with each vertex referenced multiple times, a mesh can be created very compact. The code above creates the correct shape, but it has one serious problem. If you create a tethradron in Unity, you will notice that the shading is wrong (see screenshot ‘Shared vertices’). The problem is that the shading uses the vertex normals – and there is one vertex normal for each vertex (The normals are the red line segments – this is rendered using the MeshDisplay component). The normals are calculated using the face normals (using the method RecalculateNormals() ). In this case we want sharp edges and do not want to share vertex normals. This can be done by not sharing the vertices. If you are creating a mesh without sharp edges, you should use shared normals. The following shows the source code without shared vertices. This means that each corner of the shape has three vertices (one for each normal). This creates the hard edges we want for this shape. On the screen shoot to the right you can see the three normals at each corner. 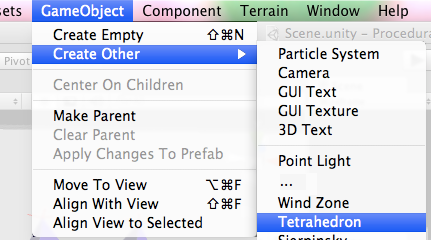 To add the Tetrahedron object to the GameObject menu in Unity, create a script in the a folder called ‘Editor’ (every script in an Editor folder allows interaction with the Unity Editor). In this script, create a static function with the annotation MenuItem. This will add the method as a menu item in Unity. This includes a simple UV mapping as well as a custom editor for the Tetrahedron component. This is really a piece of quality information! I love your blog! Excellent article, thank you for sharing all this info. I changed my plane generating methods to incorporate this method, very useful indeed. I like your articles because they are descriptive and concise. If you feel like it, I would be very interested in seeing articles describing the use of submeshes, bindposes, tangents and uv’s. Regarding uv’s, the code provided is useful but a description of their tricks and concepts (like the brilliant description of the shared vs unique normals) would be much appreciated. Thanks ! Thanks for the tutorial! The triangle faces picture/table should, on the third line, read 324 instead of 314 though. 😉 had me mighty confused there. Hi Joshua. You’re right – I’ll fix that 🙂 Thanks for the feedback. Hmm actually Unity is a left-handed coord system, so I guess your tris are actually left-hand rule order? Doh, wish I found this article before I bashed my head trying to procedurally create planes. Still helped me figure out what was wrong with my triangle winding order – Thank you very much. Hi thanks very much for this. I am getting errors with the scripts on this page in unity 3.3. The Tetrahedron.CS compiles ok but i cant see any tetrahedron when i drag the script to an empty gameobject. Your problems are unrelated to Unity 3.3. The first issue you have I cannot reproduce. Your second issue: You must have renamed a file, the github project does not contain any tetrahedron2.cs – Maybe that is the same issue for the third problem. There was a issue with dragging the script to a game object – I have updated the sourcecode in the github project and on this page. Thanks Morten, I am very keen to do this!!! I have managed to add “Tetrahedron.cs” to an empty GameObject (it doesnt say i should but i presume yes?) and it’s fine except that the Tetrahedron is invisible. here is a picture of my attempt, if it amuses you! Thanks!!! i found it ! i was making some procedural terrain for my cousins game engine and coming from an audio DSP field i know alot about how to randomise sines, multiply them in 3d graphs, make pointy, round, sine, canyon, crater derivatives of sines etc. so i hope i can make some good terrains in unity based on maths. i couldnt find any pics of all the variety of terrains i did for my cousin cos my dell is kaput. here is 2 pics. Morten, thanks for the amazing post – it is a great piece of writing. Just adding my thanks to your many fans! (1) It looks like some of the winding is the wrong way…all four should be the same. I have saved generated meshes into asset files before, but I am not sure how to save multiple sub-meshes into a single “.asset” file. I would like to be able to programmatically assign them to `MeshFilter` components. In the editor this is easy because they can simply be dragged in. I figure, there must be a way to do this within a script. Are you able to offer any pointers? I’ve got a problem, not yet assimilated how to make the UVs of a cube here is the code can someone help me? I have created an example of a procedural generated cube. https://github.com/mortennobel/ProceduralMesh/blob/master/SimpleProceduralCube.cs . Note that you need duplicate versions of each vertex to store different UV (and normal) – See https://blog.nobel-joergensen.com/2011/04/05/procedural-generated-mesh-in-unity-part-2-with-uv-mapping/ for more information. So the barrier stopping us from making more complex and interesting shapes are finding algorithms to organise all the arrays of UV’s and vertices for advanced geometrical objects. for example, a great way to make geometrical objects is to to cut the object into hundreds of parralel slices, and drawing 2d triangles, hexagons, squares, sine based 2d outlines, metaball slices… and making and procedural mesh gen wrapper that takes the simple process of varying a 2d outline on a a sequence of planes, and applying vertices to approximate the outline and join each outline to the next, to make shapes that evolve in the 2d and 3rd dimention. i wish i know how to code well enough to make a wrapper that assigns a 3d mesh to an algorithm to a series of evolving outlines in 2 dimensions. 😀 please god make a programmer that can do such a package! I found that there is a mesh extrusion example in procedural mesh demo of unity, it’s a bunch of scripts you can download from the website, the extrusion is a bit basic, but she can take the square for example and smudge it into lots of vertices through space as it moves. hi! i’ve a problem with painting a shape. I didn’t get a 3d shape it looks like 2d. What it can be? i reckon a simple document with instructions how to use those *.cs file in unity will be most productive. As for me after creating a new blank project in unity i created a folder [mNobel] in the project panel and drag into it the Editor then created a subFolder named [cs] and drag the lot of *.cs file into it. what’s next ? Really helped me a lot for my project. I have one question though. I still dont understand the how the shading is wrong in the shared vertices and what unique vertices meshes are? Any way to get the mesh out of the tetrahedron procedural model? I have a Mesh array as a public variable in one of my scripts. In the inspector I can add the built in primitives as meshes to this array, but not the tetrahedron. Will it also work for collision? I.e. when I add collision shape and set it to mesh, will it collide properly? Also, how to add textures to such procedural meshes (i.e. for example I’d like to have eye on one of sides)? To support collision, I added `GetComponent().sharedMesh = mesh;` just after `mesh.RecalculateBounds();` and checked on Convex. I also added a physics material, though I’m very new to unity so don’t know if this last step is absolutely necessary. That GetComponent call should be followed by MeshCollider in arrows but the blog’s sanitizer is stripping them out.